My mom and I took a road trip to the Sahara Desert and I’m not sure where to start. Quote of the road trip was when it started raining on our drive home and mom put the windshield wipers on; I said, “Well… at least they move.” These were how low our standards were, I honestly was impressed that they moved. 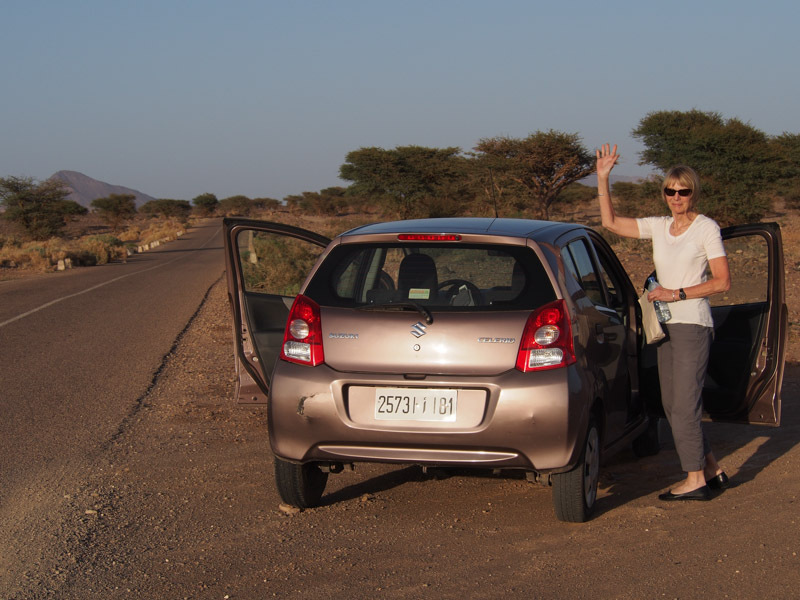 We set off over the pass of the Atlas Mountain range heading from Marrakech to Ouarzazate. Hairpin turns brought us up into snowy, rocky mountains…more rocky than snowy. There were a few towns that were more built up and populated, and some with nice lush palm tree borders fed by a passing river. But we were on a mission to our desert stay so couldn’t stop anywhere for long! Before the end of dinner my mom and I had already booked an extra night. In the words of my mom, “I just want to have nothing to do tomorrow! I want to be bored!” After busy days in Marrakech and then a ten hour drive, we were ready to be bored. Let the vacation part of the vacation begin! The next day was spent lounging by the amazing pool. When I look at these photos, the feeling of the stress from the drive flowing away from us is palpable. That evening we set off on our overnight camel trip into the desert. We were off to stay in Luxury Tents about an hour camel ride from the hotel. My mom was convinced she was going to get the rogue camel we saw sprinting wildly across the dunes earlier, but in the end they gave her the lead camel – i.e. the oldest and “most intelligent” camel – so she was in good hands. See the camel up in front – that is my camel, he needed “parking brake” ropes to keep him from getting up and being feisty. But once he was up he was great. The camels were so cute! We were a string of four camels (my mom, myself, and two other tourists behind us) all led by our guide on foot. The camel behind me kept creeping up on my left to where its head was next to my body rather than behind my camel; I would only know this because I could feel gusts of his hot breath on my elbow and from the smell I am guessing they don’t brush their teeth (this description is no exaggeration). Once at the “tents” we were treated to tea and snacks at low tables sitting on top of layered colorful rugs on top of desert sand. I put “tents” in quotes because they were so beautiful and ornate that that word doesn’t do them justice! It felt like a once in a lifetime Aladdin experience! The next morning we all woke early to climb a nearby dune for sunrise. The colors were golden orange and the views were beautiful. Of course I was up there 20 minutes longer than everyone else taking some self-portraits…. In the distance here you can see tents set up — these are military outposts along the border between Morocco and Algeria which has had a closed border since 1994. Strange to be able to see into another country that we can’t enter. Another interesting fact I learned — there are very few wild camels here. Since camels have been used as a way to transport drugs across the border, the government takes action to round up any unowned/unclaimed camels found and they are tagged and sold. Poor guys, they didn’t choose to be drug runners but pay the price! The morning camel ride back to the Auberge was my favorite part of the trip, although it’s hard to say why. I think the combination of the morning light and the quiet ride let my mind slip into the Saharan rhythm. That hour ride back felt different, remote, and somehow so peaceful. Nearing civilization we saw these two camels heading out into the sand, unbridled and free. Looking down, just me and my camel! One of the drier soccer fields in the world that I have seen! There was a stretch of road where we same maybe 40 women all garbed in similar black robes with a simple colored pattern. We wondered if they were heading to a wedding? Mom getting breakfast in the desert before the wind kicked up a sand storm! More camels… playing with filters, I feel like this could look how it was 100 years ago. There was a sand dune buggy race at our hotel our last day! Oh yeah… we got a nail in our tire which turned into a debaucle. This is the hotel staff all working on it, they were great!